This article is the final entry in a three part series where we outline steps to take to help you achieve cohesion with your business technology. By following the steps outlined, you should see a dramatic increase in the stability and flexibility of your computers and equipment, freeing you up to focus on more important matters. Click here to read part one and part two of the series. Part one of this series examined the critical areas of your business which should be in place to help you achieve peace and relaxation. Then, part two examined ways in which you can make your technology work for you, freeing up your time and allowing you to take your business anywhere. If you have not read part one and two, please do so now before continuing. Aside from stabilizing your systems, having backups and redundancies in place, automating and streamlining processes, and allowing remote access into the office, there is one more area where your technology can help you achieve a more cohesive relationship with your business. However, the easiest way to achieve peace and relaxation with your technology is by having flexible systems that work with you, not against you. In order for your technology to truly be beneficial, it should give you the ability to go anywhere you need to go. Often, this is accomplished through remote access, and mobile devices such as laptops, tablets, aircards, mobile hot spots, and more. But having flexibility is more than just being mobile with your business. It also includes being able to adjust readily and easily. When you need to add more staff, more equipment, more of anything, your current structure should be scalable, and easily grow as your business changes. Additionally, a flexible system is one that works with your schedule. This means that problems and outages are handled after hours, when at all possible, in order to have the least impact on your productive time. Now days, with computers this is completely possible, as log files often show errors on failing hardware long before the part actually breaks. This allows repairs to be scheduled when the computer isn’t in use. 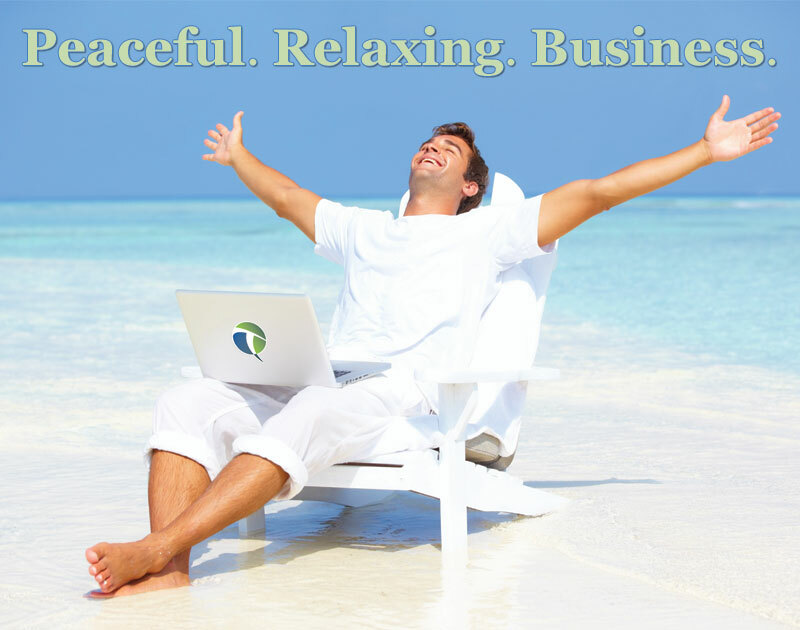 While there are many ways to achieve peace and relaxation with your business, these are some of the key areas we find to be the most beneficial for reaching this goal quickly. If your technology is problematic, chances are you are going to be dealing with headaches, stress, and more time away from your core focus, leaving you frustrated and wiped out. By taking these key components into consideration, and changing where needed, you can be on your way to a better relationship with your business. After all, your business is only as strong as the technology it uses. While this series doesn’t illustrate all of the ways to achieve peace and relaxation with your business, these suggestions will go a long way to helping you have confidence in your business infrastructure and enjoy your technology more. You should assess your business to see where improvements can be made. If you find that your current IT Company isn’t doing some of these important things, give us a call. We can help get your technology on the right track, freeing you up to focus on the most important thing – your business.